The Apotheosis of Washington in the eye of the Rotunda of the U.S. Capitol was painted in the true fresco technique by Constantino Brumidi in 1865. Science: Minerva teaching Benjamin Franklin, Robert Fulton, and Samuel F.B. Morse. Marine: Neptune holding his trident and Venus holding the transatlantic cable, which was being laid at the time the fresco was painted. Brumidi (1805-1880) was born and trained in Rome and had painted in the Vatican and Roman palaces before emigrating to the United States in 1852. A master of creating the illusion of three-dimensional forms and figures on flat walls, Brumidi painted frescoes and murals throughout the Capitol from 1855 until his death. 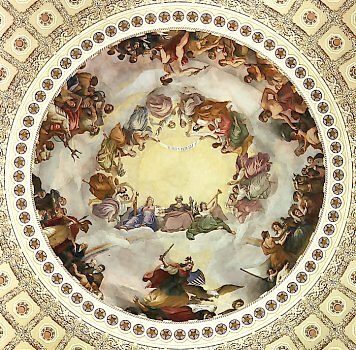 The canopy fresco, his most ambitious work at the Capitol, was painted in eleven months at the end of the Civil War, soon after the new dome was completed, for $40,000. 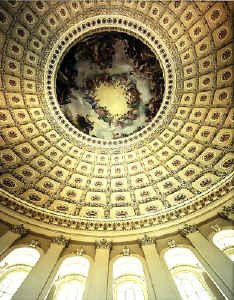 Suspended 180 feet above the Rotunda floor, it covers an area of 4,664 square feet. 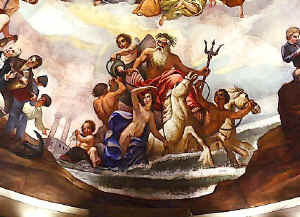 The figures, up to 15 feet tall, were painted to be intelligible from close up as well as from 180 feet below. 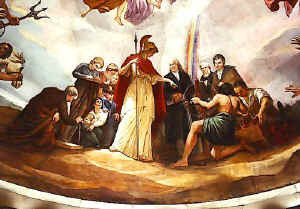 Some of the groups and figures were inspired by classical and Renaissance images, especially by those of the Italian master Raphael. 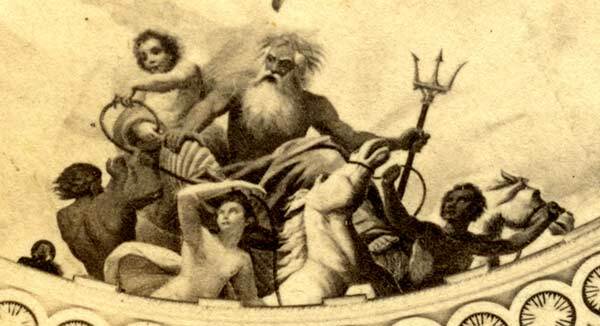 by G.D. Wakely, in the District Court of Washington, D.C.
goddess of love born from the sea, helps lay the transatlantic cable. In the background is a form of iron-clad ship with smokestacks.